The Lighting of the Royal Library of Brussels . The electric lighting is confined to one of the lecture rooms of the library, where the periodicals are kept, and the vestibule leading to it. In the vestibule there are nine Müller-Nothomb incandescent lamps and a sun-lamp of the same type as that exhibited in the Belgian section at the Paris Exhibition. The lecture room is lighted by three sun-lamps protected by opal globes. The ceiling, which is semi-cylindrical in form, assists very much in dispersing the light equally throughout the room. The current is developed by an alternate-current Gramme machine. The Müller-Nothomb lamp consists of a carbon filament in the form of a horse-shoe, with its ends attached to platinum wires passing through a plug of special cement, which closes the mouth of the globe. The globe is filled with nitrogen gas. The lamp requires a current of 2 amperes, and is said to give from twenty-five to thirty candles. In the Nothomb lamp the carbon has the shape of an inverted U, and is more massive than in those already mentioned. It is united to the platinum by ? sort of splice, secured by a twist of fine copper wire. This lamp is of Belgian invention, and is said to be twice as durable as others, the average life claimed for it being two thousand hours. I am not aware that it has as yet been sufficiently tested in this country. At the Brussels Library the electric light has been applied to the reading-room where the periodicals are kept, and to the ante-room leading to it. In this latter, nine incandescent lamps (Müller-Nothomb's system) have been placed on brackets in groups of three. Three other lamps of the same system light up a passage leading to the machine. Finally, a soleil lamp with a globe completes the installation for the ante-room. The reading-room, with its semi-cylindrical ceiling, has been fitted up with three inverted soleil lamps (p. 300). These lamps, provided with opaque globes half hidden in flower-baskets, throw a diffused light on the ceiling, whose cylindrical surface disperses the light received, and thus illuminates even the remotest corners of the room. The titles of the books can be easily read on all the shelves, and the light hidden from direct view is soft, and possesses that pleasant tint characteristic of the soleil lamp. The current is supplied by an alternating Gramme dynamo, which is driven by a locomotive engine. The machine feeds the four soleil lamps, as well as the twelve Müller-Nothomb lamps, which are joined for tension in the same circuit. 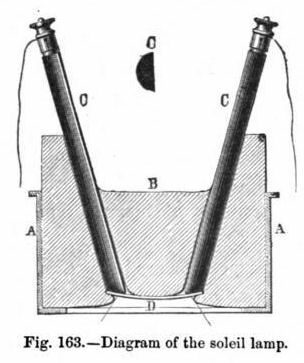 The Müller-Nothomb lamp, which is very little known in this country, differs from the other forms of incandescent lamps, not so much by the nature of the carbon filament, which is made of carbonized parchment, as by the way in which this filament is attached to the two platinum wires protruding into the lamp. The filaments are flattened out perpendicularly towards their ends, and attached to the platinum wires by a special cement. The lamp, instead of being completely exhausted, is filled with nitrogen gas. 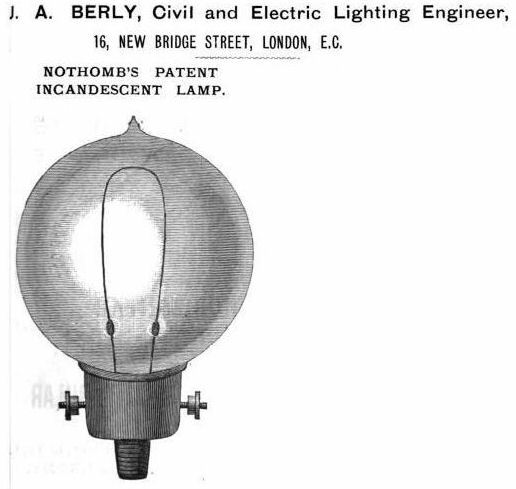 One of the characteristic features of this lamp is the resistance it opposes to sudden changes of current; it only requires a current of two amperes, and is stated to give an intensity of from twenty-five to thirty candles. From all the installations described above, it clearly follows that a mixed system of lighting has to be adopted for the individual requirements and special arrangements of different buildings. The number of these installations increases daily, but the electric light will only receive the general application it deserves when, by the establishment of central workshops, or by the reduction in price of storage batteries, electricity can be supplied cheaply, in any quantity and at any time.